I was inspired by a prompt video by Christy Sobolewski to make this page using only one stamp in many different ways. I made the stamp from scratch by cutting out diamond shapes from some craft foam and gluing it (just using Golden Matt medium) onto a wooden block. This page is quite textured as one of the techniques involved spreading light molding paste on part of the page and pressing into it with the stamp. 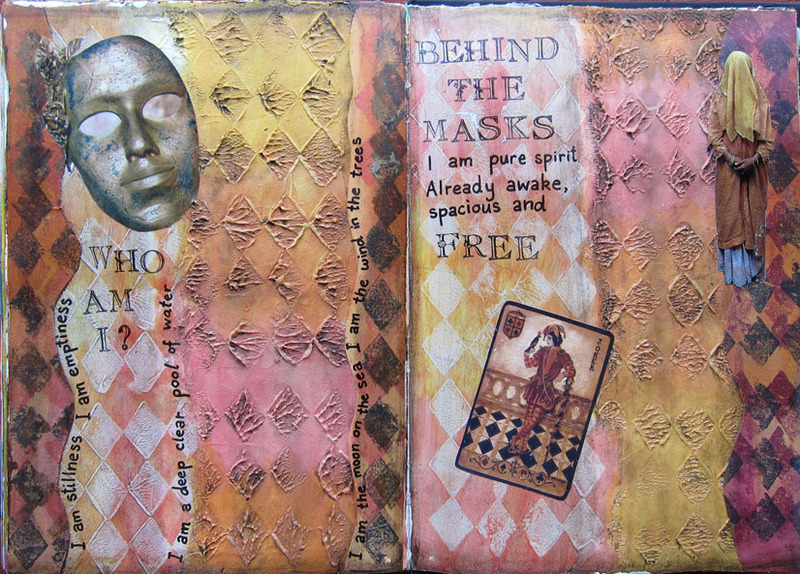 I collaged the joker/harlequin card because it seemed to go with the patterns on the page, and then I decided it was a page about Who am I behind all the masks of the ego. 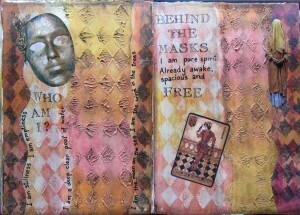 This was quite a different page from others I have done, for a start I’d never used molding paste before. It was a bit challenging collaging over such a textured background!